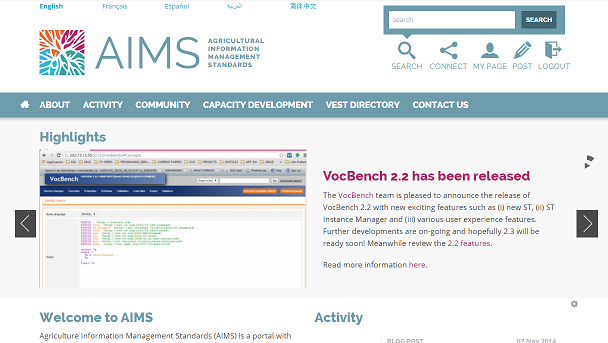 The Agricultural Information Management Standards (AIMS) new website was launched on the 23rd of September 2014 with a new theme, look and feel and functionalities. AIMS remains the portal of choice for agricultural information management specialist with an interest in standards, technology and good practices for open access and open data. AIMS website's new interface and functionalities is an output of strategic direction, technical directions and user experience received in months leading to this release. AIMS was migrated from Drupal 6 to Drupal 7, which brings with it new functionalities such as the ability to easily define references between contents by pushing the old taxonomy module to a new level of flexibility. The display suite allows the ability to standardize contents display depending on the context improving maintainability and flexibility. Conceptually, AIMS structure changed by transforming the former VEST Registry resources (now VEST Directory) to taxonomy terms, improving their visibility and content created around VEST Directory item. Furthermore, AIMS now seamlessly (taxonomies) integrate content from external repositories such as Datasets from the CIARD Ring; Organizations from CIARD RING; RDF Geopolitical Ontology; Videos from AIMS YouTube account, Presentations from Slideshare; Publications from E-LIS and News and Blog posts from CIARD. The AIMS look and feel resembles the CIARD website and soon AIMS will move to the CIARD domain. While AIMS is still facilitated by FAO, this new development makes AIMS community products on an equal level of visibility and accords all in the community with the ability to share news and experiences. In summary, AIMS will continue to i) provide advice on how to manage, disseminate, share and exchange agricultural information; ii) offer good practices on the use of metadata standards, technologies and vocabularies for the agricultural domain, and iii) offer services to its Community of Practice. In the not so distant future, AIMS will conduct a feedback exercise to find out from the community feedback on the website and also on the required user needs. AgriDrupal new version has been released.The AgriDrupal team released a new version of AgriDrupal based on Drupal 7. The new version provides the following features, new Drupal core and modules. More info. AGRIS shortlisted for the "LinkedUp Vici Competition. "The LinkedUp Vici Competition is the last competition on the tools and demos that use open data for educational purposes. AGRIS ran in this competition and was shortlisted. More info. Announcement of the new IMARK Website. The IMARK Steering group members are delighted to announce the publication of the new IMARK website.www.imarkgroup.org. More info. Creating the Turkish AGROVOC version. This is an interview with Yasemin Cevik who is from the Ministry of Food, Agriculture and Livestock in Turkey and she is in the Turkish AGROVOC version. More info. Rights of Farmers for Data, Information and Knowledge: A CIARD E-Discussion. The CIARD , with the support of GFAR Secretariat and FAO are organising an E-Discussion between 20 October 2014 for global participation on the rights of farmers for Data, Information and Knowledge. More info. AIMS website Revamp. This post reviewed the presentation of the new AIMS website to the FAO colleagues by the Macaroni Bros. More info. MOOC on Data Science in Agriculture. This is an online free course offered in the context of the agINFRA project. The MOOC introduces the fundamentals of data science, using agriculture as the common thread. More info. AGRIS Comes third in the "LinkedUp Vici Competition". During the 13th International Semantic Web Conference, vici shortlisted candidates were outlined and AGRIS came 3rd shared this position with the Visualisation of Water Resources & Ecology. More info. DCMI/ASIS&T Webinar: The Learning Resource Metadata Initiative, describing learning resources with schema.org and more. The webinar will outline the technical aspects of the LRMI specification, describe some example implementations and demonstrate how the discoverability of learning resources may be enhanced. More info. Italy. Research Data Alliance & Global Data and Computing e-Infrastructure challenges. 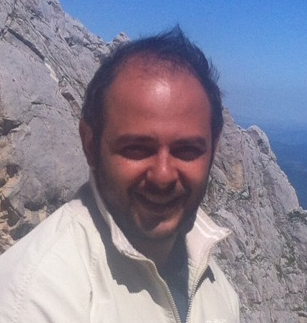 13th of November 2014 at 16:00 hrs Rome Time - "INVENIO : Pythonic Framework for Large-Scale Digital Libraries" by Tibor Simko the Head Developer of the INVENIO Digital Library Software. He leads the CERN's Digital Library Technology team and is one of Technology Directors behind INSPIRE. 27th of November 2014 at 15:00 hrs Rome Time - "How can you contribute to AGRIS with your bibliographic data?" by Elena Kokoliou is the Senior Curator Associate with Agroknow in Greece. What is a content aggregator? it's either an individual, service or organization that gathers Web content (and/or sometimes applications) from different online sources and repositories for reuse .There are two forms of content aggregation, the first simply means syndicating someones else's content that one finds from their feed. Second is creating and publishing content, then aggregating it (This has been referred to elsewhere as 'Push and Pull'). Andrea Di Sabatino is the CEO of Macaroni Brothers and has been involved in the technical development of the AIMS website for more than four years. Currently, him and his team migrated AIMS from Drupal 6 to Drupal 7. In this brief interview we ask him for more insight on the new AIMS website and the envisaged future technical developments. Read the interview "the AIMS interface has been completely redesigned to simplify user interactions" found in the AIMS Interviews section.